Sinevibes wants you to go with the Flow. Sinevibes has released Flow, another Audio Units effect processing plugin to add to its collection. In typical style, this takes a familiar concept - flanging, in this case - and then runs with it. To elaborate further, rather than simply offering up and down sweeps, as many traditional flangers do, Flow features an envelope sequencer to modulate the sound in a rhythmical fashion. 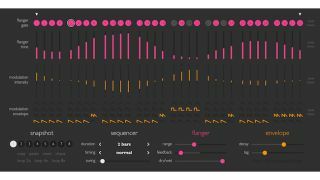 There are two different flanger 'characters' with positive or negative feedback, advanced synchronisation and timing features, plus a host of automation and randomisation options. All of this adds up to an effect that promises everything from intricate 'jet plane' patterns and dancing comb filtering to complex swooshes or stuttered glitches. What's more, each instance of Flow can store up to eight snapshots of itself, and you can switch between these in realtime or via automation. Flow is available now from the Sinevibes website priced at $29 or at a 50 percent discount when you buy the company's complete plugin collection. A demo is available, too.